An underwater camera is the one which is capable of operating underwater. It can be used for capturing underwater life, ship wrecks, corals, and sponges among others especially while scuba diving. Underwater cameras are also used for research and surveillance purposes. Underwater cameras have advanced sensors so that they can capture good quality images underwater where light becomes scarce. Additionally, they sport a robust design which includes the camera being shockproof and freeze proof. 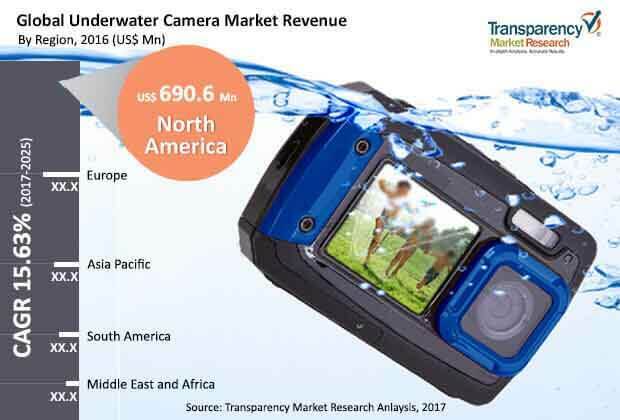 According to the research report, the global underwater camera market is likely to be worth US$8946.1 mn by the end of 2025 as compared to US$2109.9 mn in 2015. During the forecast period of 2017 and 2025, the global market is expected to surge at a CAGR of 15.63%. The global underwater camera market is segmented on the basis of end-user into personal and commercial. The personal segment is can be seen to hold a major revenue share as the underwater cameras are mostly bought by the adventure tourists in order to capture their underwater experiences and share it with their friends and family through the social media platforms such as Facebook, Instagram, Snapchat. The tourism sector is witnessing a bolstering growth and adventure tourism is the most popular segment in the tourism sector according to the World Tourism Organization (UNWTO). By sales channel, the underwater camera market is segmented into online and offline. The online segment is expected to grow at a faster CAGR of 16.84% over the forecast period. This growth is owing to the increasing internet penetration and willingness of the people to buy products online by getting the best deal of the product. Also, many manufacturers are launching their products online and organizing various photography competitions online in a bid to target and attract potential customers which will result in increased sales of their products. The offline segment is expected to hold a major revenue share of 88.02% in 2016. This is owing to the fact that a majority of the population still rely on brick and mortar stores to buy their products where the consumers get to see and feel the products and also explore a broad range of products that are kept on display. This helps them in making better purchase decisions without having to wait for the delivery of the product unlike the online channels. Adventure tourism coupled with social media platforms has gained popularity in Asia Pacific, largely due to the presence of young population which is tech savvy and keen to upgrade their existing electronic goods products. Also, the increasing disposable income of the individuals is driving the growth of the underwater camera market. An increasing number of population is eager to spend on adventure trips and dedicated cameras which can capture underwater experiences. The growing awareness among the masses regarding the various tourist destinations such as Indonesia, Maldives, and Malaysia is also driving the market growth positively. Furthermore, the increasing internet penetration across the growing economies such as India and China is anticipated to support growth of the underwater camera market. Asia Pacific region is projected to grow at fastest CAGR of 16.89% over the forecast period and reach a volume of 5.9 Million units by 2025. The key players profiled in this report are Nikon Corporation, Canon Inc., GoPro Inc., Brinno Inc., Garmin Ltd, Sony Corporation, Contour LLC., Fujifilm Corporation, Ricoh Company Limited, Olympus Corporation, Panasonic Corporation. The study provides a holistic perspective on global underwater camera market growth in terms of revenue estimates (in US$ Mn) and volume estimates (thousand units) globally. The market estimates have been analyzed by taking into account the impact of various economic, political, technological, social, and legal and the existing market dynamics influencing market growth. The report would also include executive summary, providing the overview of the global underwater camera market. The report provides industry development and key market indicators for the global underwater camera market. Furthermore, report provides market attractiveness analysis, for each segment based on their CAGR and market share. The report also provide porter’s five forces analysis about the industry competition, market dynamics and the most profitable segments in the market. This research study on the global underwater camera market provides a detailed cross segment and cross country analysis based on the different segments including end-user and sales channel. Based on the end-user, the market is segmented into Personal and Commercial. Additionally, by sales channel, the underwater camera market is segmented into online and offline. The report also covers profiles of major players, their growth strategies and focuses on the recent developments under the competition matrix section and includes market positioning analysis of key players operating in the underwater camera market. The competition matrix for key players in the global underwater camera market notes their capabilities and growth potential and also benchmarks the key companies in the global market on the basis of top line growth, market share, segment growth, infrastructure capabilities, market position, product offerings, R&D focus and future outlook. Under the company profiles section, the report also includes an overview of the players operating in the market, the annual revenue generated by them in the past two or three years, SWOT analysis, regional breakdown and their relevant business segment revenue. The report also contains market share analysis of the key players in the underwater camera market for the year 2016 based on their revenues generated for the same year.